Down the road at Kennesaw, things were really cooking. One glance at the Visitor Center parking lot and you could see that here was a major battlefield that tourists and locals alike had discovered. It is a good place to hike, and a good place to walk the dog, but the Visitor Center itself was relatively empty. 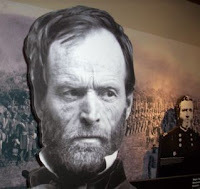 I had heard or read that, like Chickamauga and some other battlefield parks, Kennesaw is visited more by outdoor enthusiasts than by history buffs in solemn reflection of the heroic and tragic history of that ground. It's not surprising—the park offers nearly 3,000 acres of green space within an ever-tightening circle of development. After leaving the hotel in Atlanta at an early hour, driving to Resaca, then down to Pickett's Mill and Pine Mountain, we were running pretty late by the time we reached Kennesaw. Still, we had time to fit in the highlights. First stop, the gift shop/bookstore, where a couple of things caught my attention. With respect to the gifts, souvenirs, and so on, I can't remember seeing such a product selection geared toward little kids. It may be that I've simply lost touch with what's being stocked in battlefield parks now, but clearly there are a lot of families passing through. It was the first time I'd seen a U.S. Grant doll, and no puny action figure either, but one easily knee-high to a five-year-old. On the book side, I was impressed by the wide selection of titles on the Atlanta Campaign, including small press or effectively self-published works you would not easily find elsewhere, like the various William Scaife books with his beautifully drawn "architectural" overlays of troop movements on modern topo maps. With the souvenirs bagged, Park historian Willie Johnson, our guide for the afternoon, herded our pack into the theater to view the park's video production—a 20-some minute film that would set the stage for and interpret the Battle of Kennesaw Mountain. We've all seen a bunch of these at various parks, and oftentimes the film itself is a historic artifact. The Kennesaw Visitor Center film is fairly new, but I thought one thing was odd. It's possible that I'm wrong about this, but I don't think so, since I'm very tuned in to how the National Park Service treats the causes of the Civil War. It's always interesting to me to see how various films deftly craft a condensed summary of the lead-up to war, and the war to the point featured at their particular park. The Kennesaw film began as might be expected, outlining the sectional differences of the antebellum era. The Industrial Revolution was named as a driving force in the inescapable regional friction. I was curious to know when they were going to slip in talk of that other thing—the thing about an involuntary labor force. On and on it went without mention of the "S" word. At one point, I actually leaned over to my sister and whispered, "do you think they'll say the word?" I'm fairly certain they didn't. I say "fairly certain," because even though I listened to it closely, I still can't believe the Park Service produced a film giving the background to the Civil War without mentioning the thing that literally divided the nation along slave and free soil lines. Following the film, we went up to the top of Big Kennesaw for some spectacular views, and a talk by Willie. The next stop, at Cheatham Hill—the Dead Angle—was the highlight of our Kennesaw visit. There, Greg Biggs, standing before the Illiniois monument, read a powerful passage from Sam Watkins's account of that very struggle—the close-in lodgment of U.S. soldiers in front of the Confederate line, and the C.S. efforts to dislodge them. Next: the Southern Museum of Civil War and Locomotive History. From Pine Mountain to Eternity. 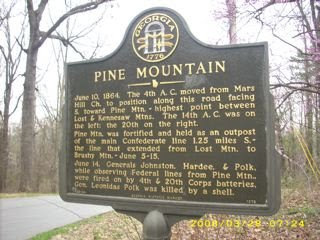 . .
Atlanta Campaign continued: after a vigorous hike at Pickett's Mill, we boarded the bus again and headed more or less due east on the Due West Road, a wartime route, making our way to the death site of Bishop Polk on Pine Mountain. There, Stealing the General author Russell Bonds, who wrote a nice piece on Leonidas Polk, posted here (originally published in the May 2006 issue of Civil War Times magazine), gave a concise summary of the fateful day, June 10, 1864, when generals Johnston, Hardee, and Polk made themselves conspicuous on Pine Mountain, in full view of Yankee artillerists. Bonds explains in his essay, "Pine Mountain is hardly a mountain at all. Rising no more than 300 feet above the surrounding countryside, the unimpressive little ridge—which is heavily wooded today but had been cleared of timber in the summer of 1864—is referred to in official reports and diaries as Pine Knob, Pine Hill, Pine Mount or Pine Top." Call it what you will, it was the end of the trail for the fighting clergyman when a Hoosier battery lobbed some shells in his direction. 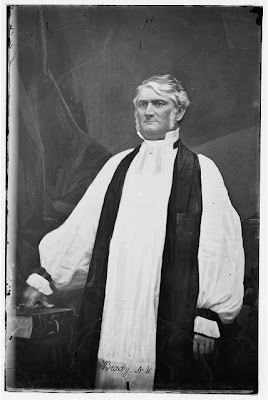 A Confederate veteran placed a monument to Polk in the near vicinity of the place where that Federal artillery round nearly split the Bishop's mortal coil in twain. Today this weathered yet substantial memorial sits on (or is surrounded by) private property, accessible from the road by a short path. I appreciate that the homeowners in this neighborhood are devoted to preserving the site. One neighbor from across the street, Melvin Dishong, came over to introduce himself, and to pass along his card offering "Pine Mountain Civil War History Tours" for no charge. Nice to see some property owners trying to promote the historical significance of their holdings, rather than bulldozing it to dissuade pesky tourists. From Pine Mountain, it's only a handful of miles to the highest peaks in the area, Kennesaw and Little Kennesaw Mountains. 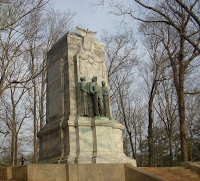 According to the NPS, "Kennesaw is derived from the Cherokee Indian 'Gah-nee-sah' meaning cemetery or burial ground." Leave it to my Pale Face brethren to ram that meaning home with volume and efficiency. 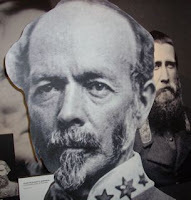 Next blog entry: Kennesaw Mountain, and the Southern Museum of Civil War and Locomotive History. More than any other place on the CW Forum's Atlanta Campaign itinerary, I was looking forward to my first visit to Pickett's Mill. Driving from Resaca, we arrived around mid-day (last Friday). The caterer met us there with some delicious box lunches, and after a quick repast, we met up with State Historian James Wooten (pictured at right), portraying a Confederate soldier. 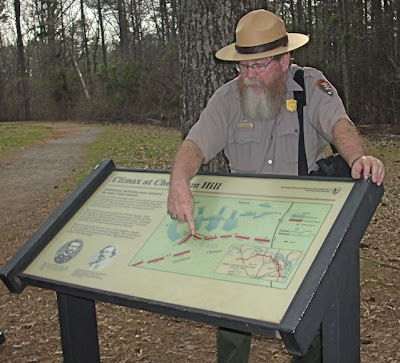 He guided us on one of the park's numerous trails—in this case a hike along the Confederate side of the fateful ravine, down to the Pickett's Mill Creek and mill site, and back up to view the impossible topography from one of the Federal jumping off points. There are no monuments at Pickett's Mill, no distracting signage beyond color-coded trail markers. Just trails in the woods. To me personally, this kind of park facilitates the most transcendent experience for the visitor. There's nothing there but the landscape. That's not to say that the great memorial parks at Vicksburg, or Gettysburg are not deeply moving, but one gets the sense at Pickett's Mill that this is as close to what it looked like as we're ever going to be able to imagine. 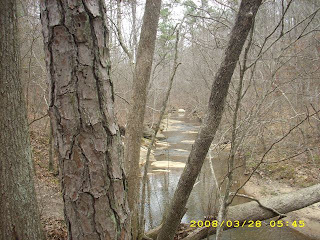 The same holds true for Port Hudson, another state park, and one of my favorites. The Pickett's Mill visitor center is situated a short walk from the Cleburne side of the ravine, so within moments the visitor is standing more or less in the heart of the battlefield. I have read a great deal about this battle over the years, even worked on maps of how it all unfolded to accompany an essay by Jeffrey Dean, who plotted out the trails there, and whose research laid the groundwork for the state's interpretation of the site. So I had a pretty good picture in my mind of what to expect. 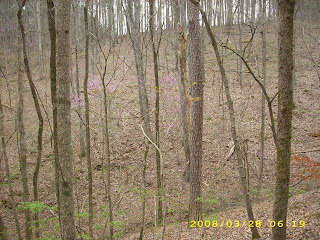 Nevertheless, it was something of a shock to see the severity of the depression—the steep grade of the ravine—across which the Federals attacked Cleburne's men, the last troops in the Army of Tennessee one would wish to assault under even the best of circumstances. One reads of the inordinate number of head wounds among the Federal casualties in this battle, and standing where Cleburne's men stood that day, there's no mystery to that gruesome detail. There's no substitute for walking the ground to spark a better understanding of what the soldiers recorded. But even beyond settling matters of historical accuracy, there's something to be gained by simply visiting the scenes of valor and sacrifice, which are also, necessarily, the scenes of fear and horror marking the experience of ordinary men in extraordinary circumstances. I had planned to knock out a quick travelogue of each day of my recent sojourn in Georgia, which would have required some fairly quick summaries at the end of some very long days. Instead, I've decided to take a little more time to recount the various events, and to give due coverage to the highlights. When I left off, we had enjoyed a presentation by Gordon Jones at the Atlanta History Center on Thursday afternoon—one week ago—and a talk by Steven Woodworth Thursday night. Come 7:45 a.m. Friday our bus, with 40 hearty souls, departed the hotel for the 90-minute ride to Resaca. It killed me to trim Rocky Face Ridge and Dalton off the itinerary, but even as it was, I probably bit off more than we could chew in a day (indeed, I ran them ragged that day, not returning to the hotel until close to 10:00 p.m.). On the drive up, one of our Dalton/Resaca locals regaled me with a spectacular tale of his classmate, Marla Maples, one-time Homecoming Queen (not to mention, former Miss Resaca Beach, 1983—you'll have to Google that one yourself) returning for her 10-year high school reunion by landing in a helicopter at the 50-yard-line. Probably the same way you returned for your 10-year reunion. Once in Resaca, which has no beach, we hooked up with Ken Padgett, president of the Friends of Resaca, which group has begun to pull off an admirable feat, qualifying for green space funds to save some relatively pristine Confederate defensive works overlooking the crossings of the Oostanaula River. See some views of Fort Wayne here, and a master plan for what will be a county park here. To grizzled veterans of Civil War Forum tours, the hospitality of the Friends of Resaca was unprecedented, even by southern standards. Out in the woods, in the middle of nowhere, they had set up some tables with coffee, bottled water, and an endless array of donuts to treat our group to mid-morning refreshments. That was a first. The Friends are going to need a lot more cash than they were able to secure through green space monies. 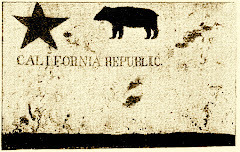 Readers of this blog are encouraged to lend a hand, or at the very least, purchase a modest membership (email civilwarforum@mac.com for details). They have also done up a nice driving tour of the Resaca Battlefield (all private sites at this time). You'll need their driving tour brochure, or local assistance, to find what you're looking for. While you're at it, look at this richly substantive site on the Resaca Battlefield. After leaving Fort Wayne, we made a stop in the vicinity of a future state park devoted to Resaca (preservation is alive and well in this small town), and to the eastern end of Snake Creek Gap. My only regret is that we did not have time to drive up the gap a few miles to view the terrain. Instead, we hurried over to the north end of the battlefield, and later did a drive-by of what is reportedly the oldest Confederate cemetery, seen here. When computer-literate Civil War Buffs come to town, you'd best alert the media. Check out this article in the Calhoun Times. Pictured in the article are Ken Padgett of the Friends of Resaca, Rudy Perini of New York, and Greg Biggs of the Clarksville, TN Civil War Round Table, who also served as one of our guides that day. One experiences clarification, and often revelation, when finally visiting the topography previously imagined only in books and in two dimensional maps. Resaca was a deathtrap for Joe Johnston's army. 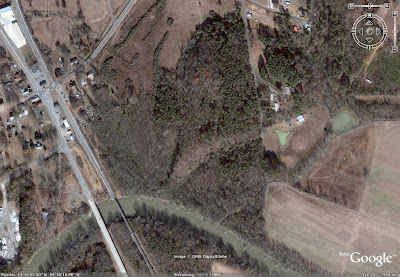 Even putting aside the controversy over which army Sherman should have sent through Snake Creek Gap, and McPherson's seemingly over-cautious advance, one wonders how the entire Army of Tennessee got across the Oostanaula with Sherman's guns in range of the bridge. After the cemetery drive-by, it was already after 10:00 a.m.—time to hurry south with Johnston's and Sherman's armies into the Hell Hole.